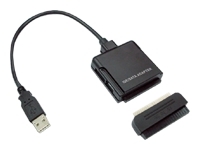 This USB 2.0 to SATA/IDE Combo Adapter allows users to use IDE or SATA (serial ATA) hard drives or both over USB 2.0 connection. Its advantage is that you can keep the existing IDE drive while at the same time move ahead to the new SATA technology, which provides a faster transfer speed of up to 150 Mbps. Both 3.5" IDE (using a converter) and 2.5" IDE are supported. Another great feature is that you can exchange data between SATA and IDE drives by attaching both drives at the same time. Any SATA or IDE drive can be conveniently turned into an external USB 2.0 storage device.